The initiative to use energy efficient materials arises due to increased consumption of energy in building & construction industry for various electrical appliances and peripherals. The goal of using energy efficient materials is to decrease the amount of energy necessary to provide products and services. Energy efficient materials are mostly used for thermal insulation of buildings and constructions. These materials allow a building to use less heating and cooling power to attain and preserve indoor heat and cold in winters and summers, simultaneously improving comfort and saving energy. Thermal insulation, efficient lighting system and insulation of windows etc. are important for energy saving. Among these thermal insulation is the most efficient and effective technique to improve the energy utilization and efficiency in the building. Fiber glass is most commonly used technique to handle harsh weather, prevent rusting and rotting etc. Global energy efficient materials market is anticipated to grow due to rising energy utilization in building & construction industry. Government initiatives like rebates, tax credits in various nations also encourage the usage of these materials by builders and construction companies. The shifting of consumer liking towards comfort oriented and eco-friendly products are predicted to enhance energy efficient materials demand in future. 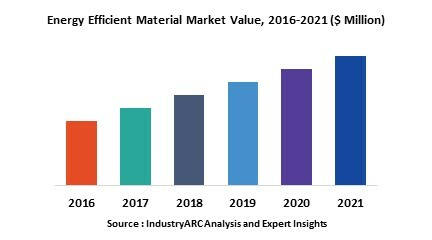 This report provides information on energy efficient materials market size for the year 2014-2016, and forecast of the same for year 2021. It also focuses on market drivers, challenges, restraints, market dynamics, growth indicators, competitive landscape, potential growth opportunities and other key aspects with respect to energy efficient materials market. North America and Europe are expected to have a significant market growth on account of escalating investments in R&D coupled with novel product development, high consumer awareness, better standard of living, government initiatives for an economical and eco-friendly environment. The concept of energy efficient homes is also increasing in Asia Pacific region, but this market will take time to grow. Based on product type, energy efficient materials have been segmented into polyisocyanurate, fiberglass, extruded/expanded polystyrene, cellulose and mineral wool. Fiber glass has better properties like excellent thermal insulation, stability and durability. Extruded polystyrene has moisture resistant, convective currents and air infiltration like properties. Wool material has static and dirt resistance, noise reduction and natural, renewable nature properties. This report is further segmented based on regional potential markets for energy efficient materials. A detailed analysis by region – North America, Europe, Asia-Pacific (APAC) and Rest of the World (ROW), has been provided in this report.